There were many stories about the journey that each of my father’s parents endured in their young lives as immigrants from Ireland. Anxious for a new life and to find work, my grandfather settled in Philadelphia in the early 1900’s, where cousins had already resided. One story that stands out more than others is about when my grandfather had his tea leaves read. Since it relates to this subject I decided to explore the topic, because we all learned that he saw his future in the leaves! He met my grandmother who also had moved recently from Ireland to begin a new life. At some point one of his cousins had come to read my grandfather’s tea leaves. This cousin was experienced in the “art” of reading and knew what he saw to be the truth! For my grandfather he saw a house, made of stone and flowers in front. My uncle has told me that “indeed, it was the house that we all grew up in!” That is the only knowledge I ever had on the subject and it was spoken as if it were an absolute truth. Tasseography is a divination that has roots around the globe. The word means the study of the cup or the graph. 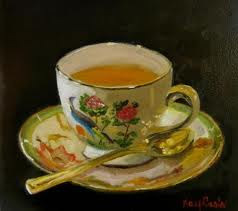 Tea ceremonies are still practiced in Japan and Australia. The first records of tea date back to around 300 BC. There are many Scottish, English and Irish authors found on this subject matter but it is not certain as to when the actual practice of fortune telling involving the tea leaves began. The practice is this; the reader or diviner will look into the cup of tea leaves after a person has drank from the cup and the energy of the drinker has transfused into the cup creating symbols in the form of shapes and letters and numbers thereby alerting the reader to certain fortune or misfortune that will come. The reader can only foretell what may currently happen in the tea drinker’s life. The position of the handle is significant to determine which direction the symbol is going, and therefore tells the reader if something is coming into the life of the person or leaving the life of the person. Different symbols can be a sign of issues of happiness, sadness, legality, health related, family related, death related and letters many times denote a name. The interpretation is solely that of the reader. The more experience the reader is, the better they can understand the symbols. This insight into the art of tea leaf reading that some distant cousin in my family possessed has confirmed that this story is certainly a good one to tell for entertainment purposes, and any chance of a relationship between the leaves and the house that my grandparents bought are purely coincidental. Aside from the fact that probably 95% of people in Philadelphia lived in a stone or brick row home is that there is no way to determine future events and as tea leaves can be read daily so then with each passing day or each cup of tea, the future changes. The placebo effect certainly may play a part in the day that follows after the leaves are read. What we have done in the past can help to shape our future. Psychologically speaking we create our own destiny! The belief that something will happen may happen because we make it happen. Crystal ball, tarot cards, tea leaves are a few of many ways that some gain financially and others gain foolishly. Would you care for a cup of tea?